Following on a cult hit is a dicey proposition. On the one hand, there's an expectation that the following product need to be superior to the original. But if you make too many changes, you risk damage to the success of your game among that rabid fan base that your original release garnered. And if you don't have them, who have you got? 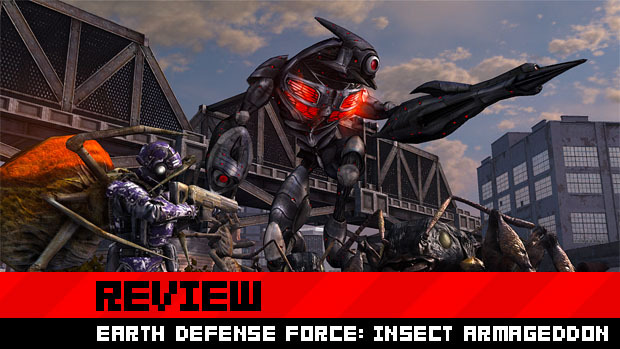 Earth Defense Force: Insect Armageddon enters this very uncomfortable territory by presenting a game which is not only a dramatic overhaul of its predecessor but manages to capture the very essence of what makes it fun to shoot bugs in the face. Your objective as a member of Strike Force Lightning is to save the city of New Detroit from the Ravagers, an invading extraterrestrial force, even if it means leveling the place to do it. It's kooky and weird, to say the least, with its story told through radio communications with characters "Ops" and "Intel" who provide you with your objectives. The dialog is delightfully (and professionally) voiced, with tongues planted firmly in cheeks, and winds up being very funny in a much more intentional manner than the screams of "EDF! EDF! EDF!" found previously. Those are still in there, of course, and the shouting of your AI partners during heated battles still provides a lovely bit of comic relief to the pressure of being set upon by gigantic spiders. With the advanced armor of the EDF, you might just have a fighting chance against the Ravagers in wielding some of the most absurdly powerful firearms found in games. How many shotguns have you seen where the shot homes in on a target? Not many, I'd wager, but they exist here. 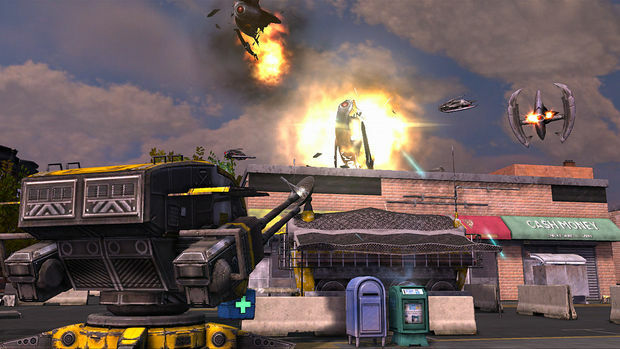 The weapons are a huge part of the appeal in Earth Defense Force, but this time around they come with some restrictions. Instead of simply being capable of wielding any weapon which you grab, loadouts are now limited to class-specific weapons available to four specialty armor types. The all-around performing Trooper armor gets access to the widest variety of weapons and reloads at a faster rate, making it a valuable contributor to any team. The more specialized armor types are more role-specific. Quick-moving Jet armor sacrifices damage resistance for speed and powers all its weapons and abilities from one regenerating energy pool that can leave you on empty if you aren't careful. 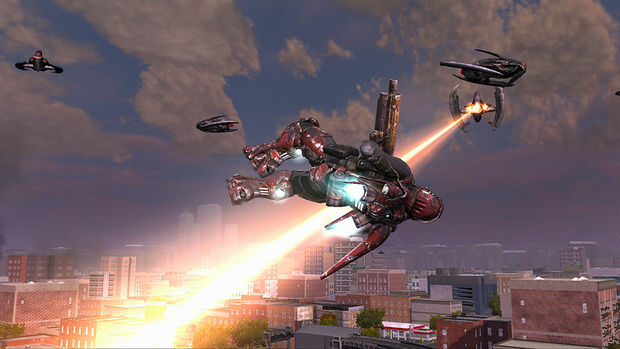 Tactical armor allows for the use of turrets while the Battle armor takes a beating with its energy shield while packing some of the heaviest ordinance in the game. While you can purchase some implements of destruction from the loadout screen, the best weapons are all dropped by enemies. Weapon drops are fairly infrequent, with only the game's larger foes dropping equipment (and not always). And in addition to the class restrictions, players are limited to using weapons within one of their earned experience levels ("Tiers"). Tiers are class-specific, so you'll have to earn experience using each type to unlock everything in the game, and there's a level cap for each of the game's difficulty levels to gradually nudge the player towards ever-greater challenges. While it might seem restrictive to limit the choice of available weapons by class and tier, with the abilities these armors convey to players there's significant risk of imbalance further into the game's progression and avoiding that was the right decision here. Not to mention the nightmare that choosing between hundreds of weapons can be in an inventory system. Thankfully, Insect Armageddon features a clean and attractive loadout management screen which makes swapping out your gear quick and easy. It also helpfully retains the last weapon selection you made with an armor type to let you hop right into the action if you don't have to change more than what you're going to wear. Fighting giant bugs is more than a little joyful. The combination of over-the-top enemy death animations and the range of weapons with which this task can be accomplished make every mission a little different and a lot thrilling, though there isn't a ton of variety in terms of actual mission objectives. By the time you've blown up your fourth troop carrier, you may be wanting for something else to do but that other thing is pretty much simply shooting bugs. No complaints from this quarter, as the impact of weaponry and mutant insects is the most important thing and it feels great, but some players will find the repetitive nature of missions a bit disheartening. 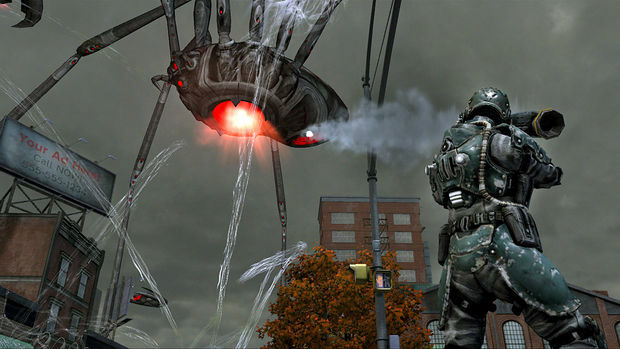 The city of New Detroit isn't a completely open world, but mission areas within it are significant in size and every building within those areas can be decimated with enough firepower applied, useful for clearing cover and eliminating the height advantage from enemies who have no difficulty climbing walls and entertaining because they all tumble to the ground like controlled demolitions. There are few things more satisfying than looking out over an engagement area and seeing nothing but rubble in your wake. Fans of Earth Defense Force: 2017 will immediately recognize nearly all of the enemy types present in Insect Armageddon, but they've received a considerable upgrade of their own. The visual appearance of the game in general is a huge step up but the big bugs and robots look particularly frightening now, especially when set upon by a massive swarm of them. New enemies like Ticks add an intensity to combat, leaping on to you and exploding if you can't get them off in time. But even though there may be more challenges here, they feel more fair to the player as well, with far fewer instances where one feels helpless to do anything while being tossed about like a rag doll from one monster to the next. A huge part of this difficulty easing can be attributed to the design focus moving more towards a squad-based shooter. Online multiplayer support is available in the campaign for up to three players or you can just sit two down on the couch together. If you don't have people to play with, surprisingly competent AI partners will take their place to shoot bugs and revive you should you fall in battle. And, for players looking for an extremely difficult challenge, these AI partners can be switched off after the campaign is completed once so that lone warriors can test their mettle against the Ravager forces. 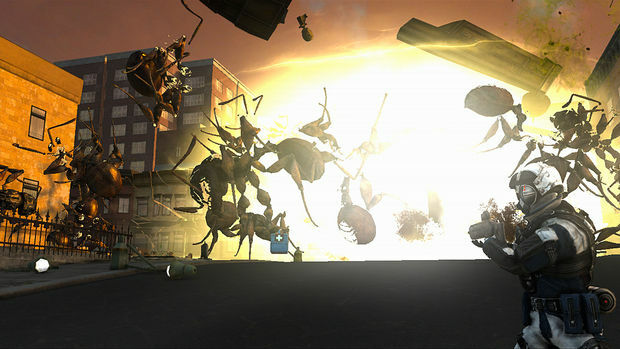 Insect Armageddon is a title with a huge amount of longevity. The fifteen mission campaign may seem short, but stages are much longer than they have been previously, requiring in the neighborhood of thirty minutes in many cases. Additionally, a "Campaign Remix" mode gives you those same fifteen missions again with completely different groupings of enemies to contend with. Finally, the Survival mode pits you against wave after wave of bugs with limited health drops and offers support for up to six players online. Even on its easiest difficulty setting in the first of ten mission areas, it's absolute murder and should provide countless hours of challenge. If you like the idea shooting a rocket into the head of a twelve-foot tall ant and watch it fly spinning into the horizon, buy this game. If you like squad-based shooters that use more than sepia tones and are willing to accept a little silliness, buy this game. And, for the love of God, if you liked Earth Defense Force: 2017, even a little bit, buy this game. It's a refreshing and fun experience throughout that offers significant challenge with a ton of heart.